Silvia, Nyakouth, and Evaline are classmates in an accelerated learning program hosted at a school in Adjumani, Uganda, where JRS is providing scholarships to some secondary school students. 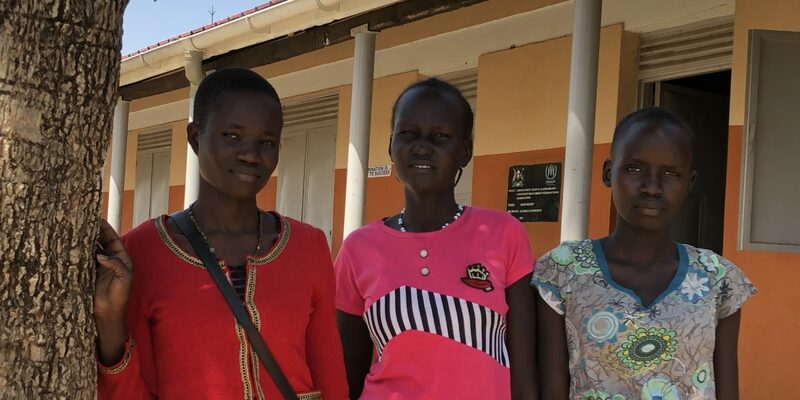 Silvia and Nyakouth are from South Sudan, while Evaline is from Uganda. They have each faced their own challenges in defying their cultures in order to access a secondary education. Now enrolled in school, all three are hopeful that their education can provide a future for them and their families. Silvia, now 19, spent her childhood in Kakuma refugee camp in Kenya, returning to South Sudan in 2013. Like many South Sudanese refugees, her family experienced multiple displacements, having to flee their home on more than one occasion due to war and conflict. In 2018, Silvia and her family left South Sudan for the second time, arriving in Uganda. Despite the disruptions she faced in her education, she dreams of going to university and becoming a nurse. I want to be educated so that I can get a job and send my children to school.